Do Hedge Funds Love Fiat Chrysler Automobiles NV (NYSE:FCAU)? How do we determine whether Fiat Chrysler Automobiles NV (NYSE:FCAU) makes for a good investment at the moment? We analyze the sentiment of a select group of the very best investors in the world, who spend immense amounts of time and resources studying companies. They may not always be right (no one is), but data shows that their consensus long positions have historically outperformed the market when we adjust for known risk factors. Fiat Chrysler Automobiles NV (NYSE:FCAU) has seen an increase in support from the world’s most successful money managers of late. There were 27 hedge funds in our database with FCAU positions at the end of the previous quarter. At the end of this article we will also compare FCAU to other stocks including SL Green Realty Corp (NYSE:SLG), ONEOK, Inc. (NYSE:OKE), and Vantiv Inc (NYSE:VNTV) to get a better sense of its popularity. Keeping this in mind, we’re going to review the new action surrounding Fiat Chrysler Automobiles NV (NYSE:FCAU). At the end of the third quarter, a total of 31 of the hedge funds tracked by Insider Monkey were bullish on this stock, up 15% from the second quarter of 2016. 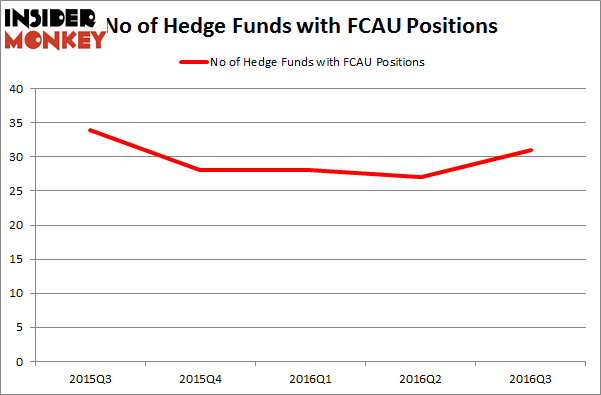 On the other hand, there were a total of 28 hedge funds with a bullish position in FCAU at the beginning of this year. So, let’s find out which hedge funds were among the top holders of the stock and which hedge funds were making big moves. Of the funds tracked by Insider Monkey, OZ Management, led by Daniel S. Och, holds the largest position in Fiat Chrysler Automobiles NV (NYSE:FCAU). According to regulatory filings, the fund has a $133.2 million position in the stock, comprising 0.8% of its 13F portfolio. The second most bullish fund manager is Cliff Asness of AQR Capital Management, with a $125.1 million position; 0.2% of its 13F portfolio is allocated to the company. Remaining peers with similar optimism include D. E. Shaw’s D E Shaw, Mohnish Pabrai’s Mohnish Pabrai and David Costen Haley’s HBK Investments. We should note that none of these hedge funds are among our list of the 100 best performing hedge funds which is based on the performance of their 13F long positions in non-microcap stocks. Hedge Funds Are Still Buying Novanta Inc (USA) (NOVT) Is Northstar Realty Europe Corp (NRE) Going to Burn These Hedge Funds? Is Liberty Sirius XM Group (LSXMK) A Good Stock To Buy? Hedge Funds Don’t Think Very Highly of Annaly Capital Management, Inc... Is Nordic American Tanker Ltd (NAT) A Good Stock to Buy? Should You Avoid Nationstar Mortgage Holdings Inc (NSM)?